The Great Salt Lake Desert is a large dry lake in northern Utah, United States, between the Great Salt Lake and the Nevada border which is noted for white evaporite Lake Bonneville salt deposits. 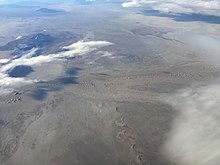 Several small mountain ranges criss cross through the edges of the desert, such as the Cedar Mountains, Lakeside Mountains, Sliver Island Mountains, Hogup Mountains, Grassy Mountains, and Newfoundland Mountains. On the western edge of the desert, just across the border with Nevada, stands Pilot Peak in the Pilot Range. The desert is cool during the winter and includes unusual plants adapted to the dry conditions. Most of the desert receives less than 8 inches (200 mm) of annual precipitation. The salt crust covering the desert reforms each year when the rain evaporates. The military's Utah Test and Training Range is in the northern portion of the desert. The lowest part of Juab County is located just south of the Dugway Proving Grounds, about 1.5 miles (2.4 km) northwest of the northwest corner of the Fish Springs Range. During Jedediah Smith's 1826-27 expedition, Robert Evans died in the desert  and in the 1840s, westward emigrants used the Hastings Cutoff through 130 miles (210 km) of Great Salt Lake desert to reduce the distance to California. The 1846 Donner Party's difficulties in making the crossing contributed to their becoming snowbound in the Sierra Nevada. Howard Stansbury explored the desert in 1849. In 1956, I-80 replaced the Wendover Cut-off across the desert, including a straight east-west section for ~50 miles (80 km) between the Cedar Mountains to the east and Wendover on the Utah/Nevada border. Following a railway completed across the desert's Bonneville Salt Flats in 1910, the flats were first used as a speedway in 1914. The world records for highest land speeds are regularly broken here. The Great Salt Lake Desert experiences a desert climate with hot summers and cold winters. The desert is an excellent example of a cold desert climate. The desert's elevation, 4,250 feet above sea level, makes temperatures cooler than lower elevation deserts, such as the Mojave. Due to the high elevation and aridity, temperatures drop sharply after sunset. Summer nights are comfortably cool. Winter highs are generally above freezing, and winter nights are bitterly cold, with temperatures often dropping well below freezing. The desert's Wendover AFB operated from 1940 to 1986. ^ a b "Seasonal Temperature and Precipitation Information". wrcc.dri.edu. Western Regional Climate Center. Retrieved 24 Mar 2013. ^ Nash, Fred J (2008). Utah's Low Points: A guide to the Lowest Points in Utah's 29 Counties. pp. 114–122. ISBN 978-0-87480-932-9. ^ Smith, Jedediah Strong. "Diary of Jedediah Strong Smith: The Crossing of the Great Salt Lake Desert". xmission.com. Retrieved 26 Dec 2016. ^ Tea, Roy D. "The Great Salt Lake Desert". scienceviews.com. Retrieved 26 Dec 2016.